I’m beginning to think Kevin McNamee can write anything. He wrote a book about a girl who wants to trade in her sister; he wrote a tale about a young boy who imagines what it would be like to be just about anything; and he also wrote a book about rulers who were so bored they made up silly rules for their people to follow. Now McNamee has written a book that combines Science and Math in a fun way. Lightning Strikes teaches kids to count backwards while it also explains how you can use counting to judge how far away thunder is. 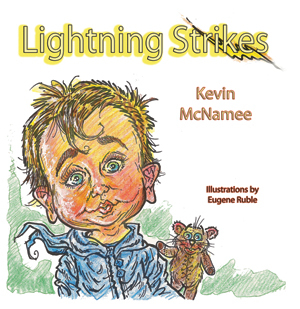 In his typical style, McNamee uses humor and rhyme to tackle a less than funny subject. Children can be scared of storms. The little boy in Lightning Strikes is no different. As he counts backwards, the thunder gets closer and closer, until even his parents have joined him under the bed. Artist Eugene Ruble provided the illustrations for this one. As some of you might know, Ruble also created the artwork for my book, Little Shepherd. His versatility as an artist never ceases to amaze me. In one book the illustrations can be serious and touching. Then in the next book they are zany and silly. In addition to the fact that McNamee’s books are always fun, he comes up with some of the most unique story ideas. I can’t wait to see what he comes up with next! Publisher: Guardian Angel Publishing, Inc.
Also available in eBook formats through the publisher’s website.